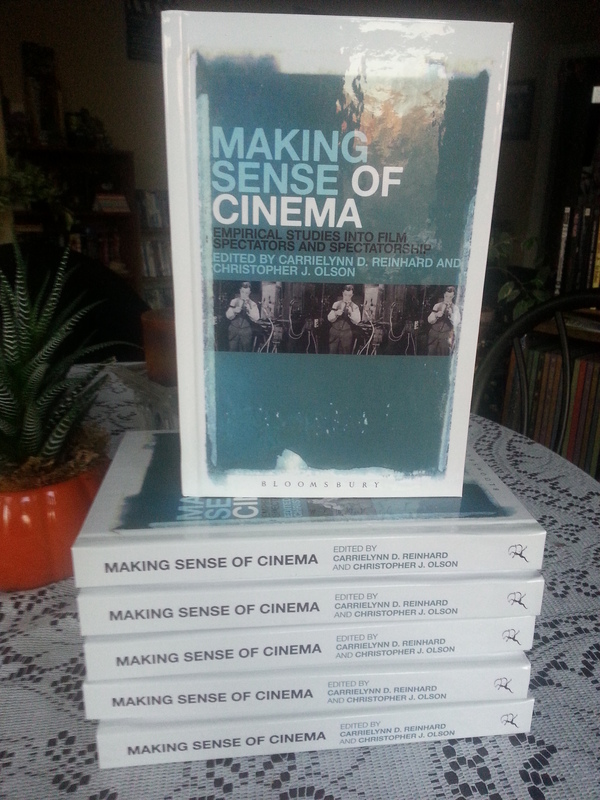 Edited by CarrieLynn and myself, Bloomsbury Academic will release Making Sense of Cinema: Empirical Studies into Film Spectators and Spectatorship on Feb 25, 2016 and you can pre-order your copy now directly from the publisher or from your favorite online retailer (such as Amazon, Barnes & Noble, and more). The collection features essays by Martin Barker, Alexander Geimer, Darren Waldron, Annie Dell’Aria, Jessica Hughes, and many more (for a complete list of contributors and chapter titles, check out the publisher’s website). There are a variety of theoretical and methodological approaches to researching how film spectators make sense of film texts, from the film text itself, the psychological traits and sociocultural group memberships of the viewer, or even the location and surroundings of the viewer. However, we can only understand the agency of film spectators in situations of film spectatorship by studying actual spectators’ interactions with specific film texts in specific contexts of engagement. Making Sense of Cinema: Empirical Studies into Film Spectators and Spectatorship uses a number of empirical approaches (ethnography, focus groups, interviews, historical, qualitative experiment and physiological experiment) to consider how the film spectator makes sense of the text itself or the ways in which the text fits into his or her everyday life. With case studies ranging from preoccupations of queer and ageing men in Spanish and French cinema and comparative eye-tracking studies based on the two completely different soundscapes of Monsters Inc. and Saving Private Ryan to cult fanbase of the Lord of the Rings Trilogy and attachment theory to its fictional characters, Making Sense of Cinema aligns this subset of film studies with the larger fields of media reception studies, allowing for dialogue with the broader audience and reception studies field. CarrieLynn and I are extremely proud of this book (not to mention humbled by these gushing reviews), and we believe it represents an important contribution to the area of film studies, primarily because it consolidates a variety of empirical approaches into one volume that functions as a sort of methodological toolbox. We hope you agree.